Nebraska took the first meeting with a dominant defensive performance in the fourth quarter at home. Michigan returned the favor in the rematch Thursday night. 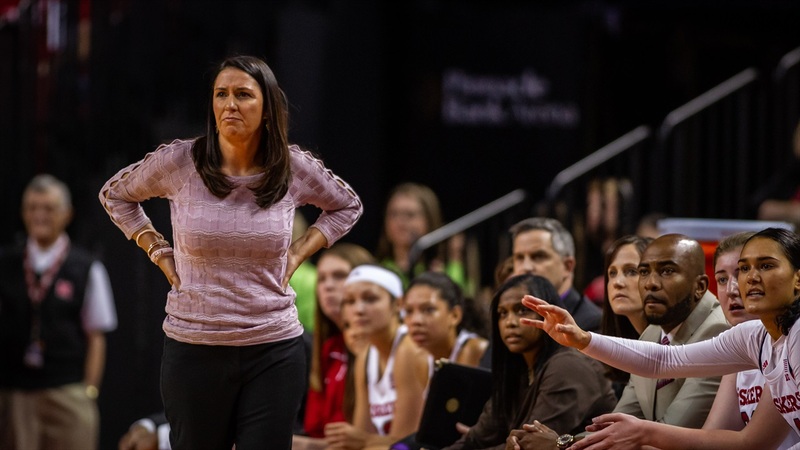 Nebraska led 51-49 with four minutes left, but Michigan’s defense clamped down on the Huskers and sent head coach Amy Williams’ crew home with a 67-61 loss. Nebraska found itself trailing by as much as 10 in the second quarter, but fought back to eventually take a lead midway through the third. Junior point guard Hannah Whitish spearheaded the comeback, scoring eight of her team-high 13 points during the stretch. Sophomore wing Taylor Kissinger and center Kate Cain were instrumental in the comeback as well. At the end of the third, Nebraska held a one-point lead. Then the Huskers made just one shot from the field in the first 8:20 of the final quarter and didn’t take a single free throw. Michigan only made two shots from the field the whole quarter but the Wolverines didn’t have an issue getting to the free throw line. Nebraska couldn’t even get close. The Huskers had five of their 18 turnovers in the first eight minutes of the fourth. Michigan registered four of its 13 steals in the frame. And when the Wolverines didn’t turn the Huskers over, they made it miserable to get a shot off. Nebraska looked out of sorts in the halfcourt and couldn’t get out into transition because of Michigan’s offensive commitment to getting inside and getting to the line. The Huskers did well to limit Michigan’s leading scorer, post Hallie Thome, to just eight points and two rebounds in 32 minutes (she came in averaging 13 and six) and star freshman point Amy Dilk only played six minutes before a knee injury forced her out. But, Michigan got another standout game from one of the conference’s best freshmen, Naz Hillmon. The forward went for 18 and 11 in 26 minutes off the bench and punished the Huskers in the fourth. Eight of her points came in the final 10 minutes and six of those eight came at the free throw line, which underscored another problem in the fourth. While NU couldn’t manufacture offense at one end, it gave away too many free points to Michigan at the other end. The Wolverines ended the game with a 25-6 advantage in free throw attempts. They only made 17 of those 25 (Nebraska made three of its six) but 15 of those makes and 21 of those attempts came in the fourth quarter. They had more free throw makes in the frame than Nebraska had total points. Nebraska ended shooting 42 percent from the field and 35 percent from 3-point range. Whitish added three assists and three boards to go with her 13 points. Cain had one of her better performances of the season with 12 points, six rebounds and three blocks. Kissinger had 12 points, with 11 coming in the second half. Junior guard Nicea Eliely stuffed the statsheet with four points, eight rebounds, six assists, three blocks and a steal. Freshman guard Sam Haiby added eight points and two assists in 21 minutes off the bench. The loss dropped the Huskers to 10-13 on the season and 5-7 in Big Ten play. It will also go down as the Huskers’ 11th game this season decided by two possessions or less, tying a program record for games in a single season. Whether its youth or something else, the Huskers remain unable to close late in the close ones; they’re now 2-9 overall and 1-6 in Big Ten games decided by six points or fewer. Williams and company return home to take on Purdue Sunday at 2 p.m. CT in the annual Play4Kay Day. Fans are encouraged to wear pink to the game in order to promote cancer awareness. It will also be alumni weekend in Lincoln with more than 50 former Huskers scheduled to attend Sunday's game and be recognized at halftime.